SmartVent uses over 1,000 electronic micropumps to produce liquid aerosol in a manner unlike any technology currently available. At the heart of the SmartVent aerosol generator is a unique dome-shaped aperture plate containing over 1,000 precision tapered holes, surrounded by a vibrational element. 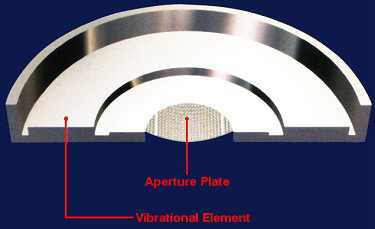 When energy is applied, the aperture plate vibrates. This vibration causes each aperture to act as a micropump, drawing liquid through the holes to form consistent optimal sized droplets.